THE WOMEN'S RETREAT HAPPENED. And I was there. With Minnesota Girlfriend. And then we drove home to Chicago and ate Thai food and watched Doctor Who. We learned about the Enneagram, and if you haven't done it and you don't know your number, I don't even know what you're doing with your life, because it's like Myers-Briggs, but way better because it doesn't involve a bunch of letters I have to remember. 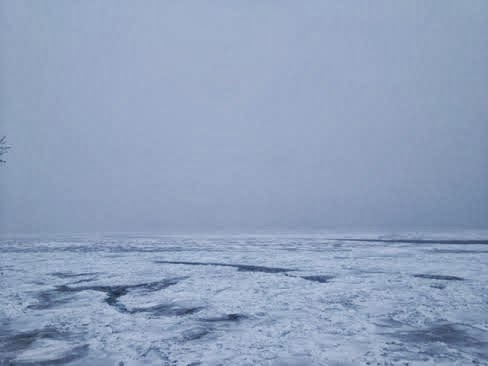 Also MG and I went for a walk on Saturday after it'd snowed (this was in Wisconsin, and they mayyybe get more snow than we do), and we saw Lake Michigan and it looked like an alien planet. And then we took a selfie because WE LIVE IN A MODERN AGE OF WONDERMENT. Anyway. The women's retreat is the greatest of retreats. And also -- BLEAK HOUSE STARTS TOMORROW HOW FAR ARE YOU YOU NEED TO READ THROUGH CHAPTER ELEVEN. ELEVENNNN. I am on like chapter five myself. But I was WOMEN'S RETREATING, so there was no reading. From what some of you have mentioned, you have Certain Things to Say about Ms. Summerson, which I am most delighted to hear, as ACADEMICS DO AS WELL, so rest assured it is not just you. I will address this in my hopefully-not-scattered post. Ah, the excitement of the #BleakAlong (hashtag contributed by our ever-awesome Tika). READ ON.